A deed is a legal document that transfers title to real property from one party to another. 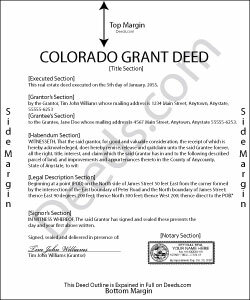 In Colorado, property owners can use a grant deed to transfer real estate. When completed and filed properly, a grant deed is a conveyance in fee simple of the grantor's interest in the real property to the grantee (30-113, 38 C.R.S.). Any explicit covenants described in the document are binding upon the grantor and his/her heirs (30-113(3), 38 C.R.S.). A lawful grant deed includes the grantor's full name, marital status, and address, the consideration given for the transfer, and the grantee's full name, marital status, vesting, and mailing address. Vesting describes how the grantee holds title to the property. Generally, real property is held in either sole ownership or in co-ownership. For Colorado residential property, the primary methods for holding title in co-ownership are tenancy in common and joint tenancy (31-101, 38 C.R.S.). As with any conveyance of realty, a grant deed requires a complete legal description of the parcel. Recite the source of title in order to establish a clear chain of title, and detail any restrictions associated with the property. Each grantor must sign the document in the presence of two credible witnesses or an officer authorized to take acknowledgements of instruments having to do with real property (35-101, 38 C.R.S.). Spousal joinder is required to convey homestead property (35-118, 38 C.R.S.). This means if the grantor is married, both the grantor and their spouse must sign the document. Record the completed deed, along with a real property transfer declaration (TD-1000), in the clerk and recorder's office of the county where the property is located. Contact the same office to verify accepted forms of payment. This article is provided for informational purposes only and is not a substitute for the advice of an attorney. Contact an attorney with questions about grant deeds or for any other issues related to the transfer of real property in Colorado. Paul F. said: Excellent - no reservations. I used them on a Sunday and had my info on Monday. Not only did they execute the order flawlessly, the fixed my screw up* immediately. *I hit refresh before the "secured" page transmitted, so I created (2) two orders of the same item. Reply from Staff: Thanks for the review Paul, glad you were happy with the service and staff. Our staff is pretty good at catching the few duplicate orders that get through. Reply from Staff: Thank you Debra, we appreciate your feedback. Have a wonderful day!